Please note: the images here are taken from the 2000 standard definition DVD and not the newly released 2017 Blu-ray under review. 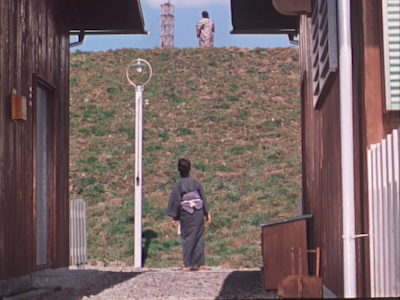 Yasujiro Ozu’s light 1959 comedy GoodMorning was one of my first Criterion blind buys. Spotted in a now-closed used record store in Portland, I snatched it up on sight, knowing if I didn’t, it would be gone before I could ever go back to grab it. Such was the rarity of seeing Criterion discs in second-hand bins back in the day--all too unusual, you had to act. Luckily I had rolled the dice on a pretty safe bet. 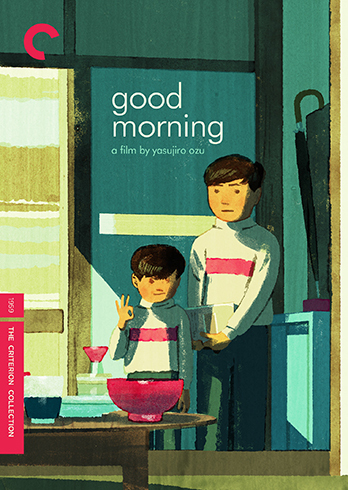 Good Morning is brimming with joy, even as it maintains Ozu’s usual unassuming attitude. Set in a Tokyo suburb, this genial film tells the stories of several neighboring families. Linked mostly by their young sons, these individual units are subject to gossip, misunderstanding, and judgment--negative foibles hidden just below a very positive surface. You know, the way clans and communities do. 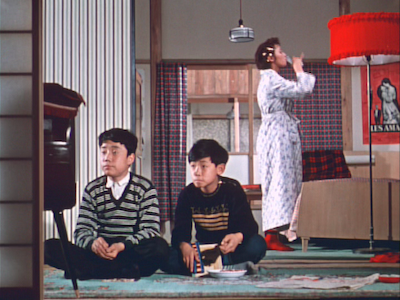 When you boil it down, Good Morning is about family, just like most of Ozu’s oeuvre. In this case, not just family by blood, but the community you build. Oh, and it has fart jokes. To be more exact, one running fart joke that carries through the whole movie. And I don’t care what you think, I love fart jokes. And poop jokes. Especially when a fart joke becomes a poop joke. Which it does here, to hilarious effect. 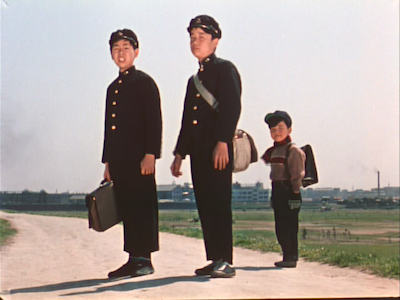 Though the four boys connect all the houses--including the misunderstood hipster couple with the television and the single English tutor who provide the kids refuge--the central duo of older brother Minoru (Koji Shidara) and younger brother Isamu (Masahiko Shimazu, Late Autumn [review]) end up driving most of the movie. 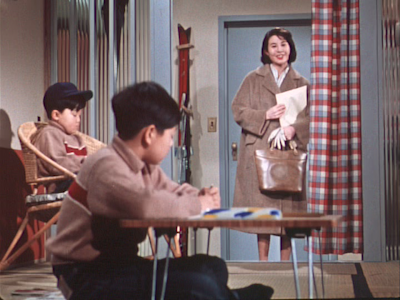 They get the most screen time with their private protest against their supposedly stingy mother (Kuniko Miyake, star of many Ozu films, including Early Summer and Tokyo Story [review]) and her refusal to buy them a TV of their own. Mother Hiyashi is more frugal than stingy, it’s up to her to keep the house on budget, but this is also not the only time in Good Morning that she is accused of financial malfeasance. Another driving storyline is the issue of the missing dues from the local women’s organization. The ladies have varying theories of who made off with the cash, and even though it gets an amicable resolution, the way the situation is concluded splinters off into its own conspiracy theories and gossipy tributaries. There’s not much to do throughout the day, it seems, but get in each other’s business. It’s all innocent and meaningless until it isn’t. Such little things, they make a big difference. In addition to these kinds of family dynamics, Ozu regularly explored the differences between generations in his movies, and Good Morning is no exception. Here, the aforementioned television is the most prominent example of how times are changing, and the director is certainly seizing upon the cultural shifts occurring at the end of the decade. The kids learning English, the progressive neighbors with posters for French films on their walls (and not just any French film, but Louis Malle’s The Lovers [review]), the nervous patriarchs set adrift in a changing economic landscape--these are all signs of the time. Prescient ones, too. Dad is worried about maintaining employment long enough to have a solid retirement, kids are worried about watching sumo wrestling in the living room. 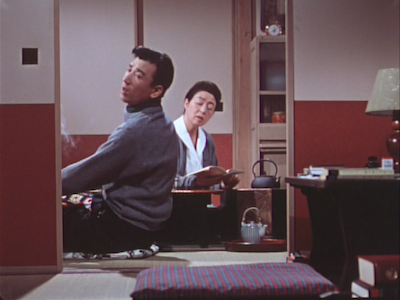 A more judgmental director (like, say, Douglas Sirk in All That HeavenAllows) would be concerned for how this younger generation was going to rot its brain--indeed, one of the older men in Good Morning expresses such a fear--but Ozu seems to take no stance. He is amused by the rebellious youngsters staging their own revolution, but also empathetic to the parents who need to keep things together. If Ozu is siding with anyone, it’s probably the middle generation, like the tutor or the boys’ aunt, both of whom bridge the divide. Is it any surprise, then, that they end up having a little romance? What may be more interesting here, though, is how Ozu is adopting modern techniques to tell this modern story, particularly since Good Morning is an update of his 1932 silent film I Was Born, But...--which was previously available in the Eclipse set Silent Ozu: Three Family Comedies [review], but is also included in full as an extra on this Good Morning upgrade. Shot in vibrant Technicolor by Yushun Atsuta, Good Morning has a look not dissimilar to television’s nascent genre, the sitcom, a comparison further backed by the episodic nature of Good Morning’s narrative and the jazzy lounge score that keeps the action moving. (Toshiro Mayuzumi was a prolific composer for Japanese movies, working also with Naruse, Imamura, and Kurahara.) Not to mention how all the complicated imbroglios have really simple explanations, the discoveries of which only lead to more complications. It’s almost a shame there wasn’t a spin-off so we could have watched all the kids grow up on a weekly basis. Fans of Good Morning should be pleased with this new 4K restoration. The colors are gorgeous, and the image quality pristine. Given the gap between this release and the original DVD, Criterion had a lot of new technology to put to use in making Good Morning look good, and the results are stupendous. In addition to I Was Born, But..., fans of silent film will also appreciate the inclusion of the short A Straightforward Boy, a 1929 effort from Yasujiro Ozu, presented here incomplete, in its only existing form. One of the first efforts of the director to create comedy using children, it’s an amusing trifle about kidnappers being stymied by a child who never quite realizes he’s being kidnapped, and proving too much to handle in the process.